Topics: Aaa Reefs, Maintenance And Design, and Coral Propagation. 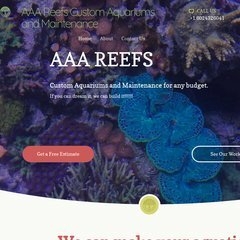 aaareefs.com AAA reefs 602 432 6041 aaareefs.com Custom Aquarium Design .. There are 2 Nameservers, ns23.domaincontrol.com, and ns24.domaincontrol.com. Godaddy.com Inc (Arizona, Scottsdale) is the location of the Apache server. Its IP Number is 64.202.166.217. PING (64.202.166.217) 56(84) bytes of data.